OrthoXel is a specialist orthopaedic trauma company, using innovative engineering design to evolve truly next generation fracture fixation devices. OrthoXel is delighted to announce that following United States FDA 510k and CE mark clearance for the Apex Tibial Nailing System, the new Apex Femoral Nailing System has been granted European CE Mark, following the FDA 510(k) earlier in the year. The Apex Femoral Nailing System has the potential to be implanted by the surgeon in antegrade (at the hip) and retrograde (at the knee) as a universal nail for left and right legs, dramatically reducing hospital inventory. Like the Apex Tibial Nailing System, the Apex Femoral Nailing System has the OrthoXel patented micromotion locking to stimulate bone callus formation. The new Apex Femoral Nailing System was showcased at the Orthopaedic Trauma Association meeting in Orlando, Florida in October and will be presented in the UK at the Orthopaedic Trauma Society annual meeting in Burton-on-Trent January 10-11th 2019. The Apex Femoral Nailing System features a modern anatomic nail curvature in a universal nail that can be surgically implanted from antegrade or retrograde orientations with a dedicated instrumentation kit. The system offers a comprehensive suite of versatile multiple-trajectory locking options including patented OrthoXel™ micromotion for controlled axial movement with exceptional torsional stability to promote callus formation. 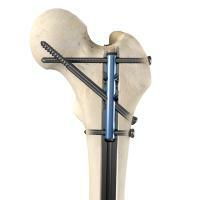 Additional locking options include recon and rigid interlocking for unstable proximal femoral fractures. Proximal Micromotion: Up to two mediolateral bone screws and one recon bone screw provide torsional stability with patented controlled axial micromotion. Proximal Recon Rigid Locking: Up to two mediolateral bone screws and two recon bone screws provide rigid locking, with an optional locking endcap. Proximal Rigid Interlocking: Up to two mediolateral bone screws, one recon bone screw, and one interlocking bone screw provide rigid locking. The optional addition of the locking endcap simultaneously locks all four screws when needed. Founded in 2014, and partially funded under the Enterprise Ireland, High Potential Start-Up (HPSU) fund. OrthoXel is a specialist orthopaedic trauma device company, using innovative engineering design to evolve truly next generation fracture fixation devices. OrthoXel is committed to patient-focused fracture care, offering surgeon-designed devices and an innovative approach to clinical evaluation, from initial concept designs through to full product launch.